﻿ India and Maldives sign three agreements. India and Maldives sign three agreements. Maldives and India have signed three key agreements. 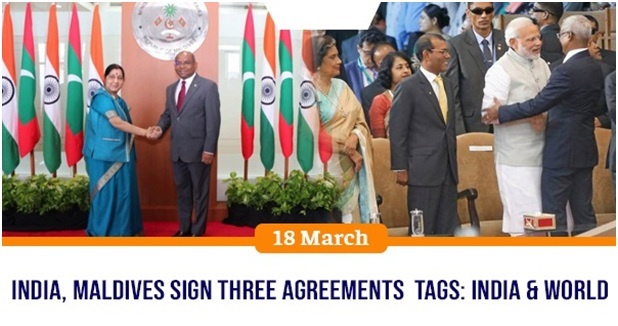 The agreements were signed following a meeting between Minister of External Affairs of India Sushma Swaraj and Minister of Foreign Affairs of Maldives Abdulla Shahid. The agreements signed during the trip were on visa facilitation for diplomatic and official passport holders, development cooperation and renewable energy. Under the agreements, Maldivian diplomatic passport holders can stay in India longer via free visa. Moreover, India will assist Maldives in its development and enhancing renewable energy resources. It is the first time Sushma Swaraj arrived in Maldives on an official visit on an invitation from Minister of Foreign Affairs Abdulla Shahid.